Community organizers are fighting for renters facing eviction because of foreclosure. This article is from the March/April 2009 issue of Dollars & Sense. The United States is in the midst of a national foreclosure crisis that threatens to wreak havoc not just on homeowners, but also tenants, urban neighborhoods, and entire cities. Community organizers and legal activists are working hard to stop it. Over 2 million properties went into foreclosure proceedings last year, a number that experts fear could jump to 10 million in the next few years. Foreclosures aren’t just pushing owners into the street. According to the National Low Income Housing Coalition, renters make up an estimated 40% of families facing eviction because of foreclosure. And because the shakiest loans are concentrated in inner cities, the impact of vacant buildings on already fragile neighborhoods can be devastating. 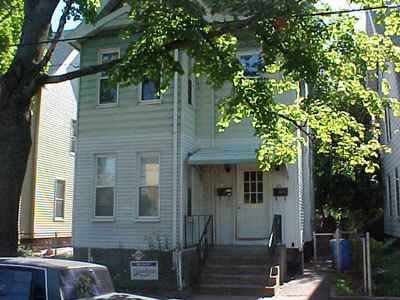 A 4-family house in the Fair Haven section of New Haven, CT, before foreclosure and removal of tenants through eviction and payment to move by Deutsche Bank. The pre-foreclosure price was $160,000. Now the group scans the latest foreclosure listings and goes door to door to alert tenants. They host meetings with people at risk of eviction, provide assistance and advice about negotiating with lenders, and organize demonstrations outside banks. They also work with former owners who hope to renegotiate their loans with the banks and keep renting out their properties. The same house in January 2009. 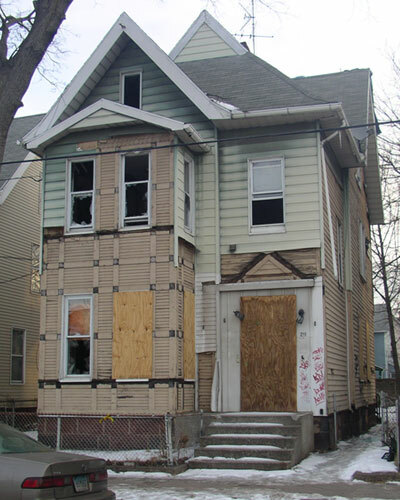 After the foreclosure and eviction of all the tenants, the house sat vacant for 17 months until its ultimate sale in December 2008 for $16,000. The house was completely gutted and stripped by vandals of any items of value, from copper pipes to aluminum siding. Photos courtesy Amy Eppler-Epstein. Thanks to the group’s tactics, scores of tenants and former owners have stalled foreclosures, negotiated higher payout deals, and even forced banks to cut mortgages. Housing advocates are also taking the battle to state and federal policymakers. In December, New Haven Legal Assistance (NHLA) threatened to sue Fannie Mae and Freddie Mac for illegally evicting tenants in buildings the federal lenders had foreclosed on. The agencies backed down and drew up new rules that stopped the practice. Now activists are pressing for the same rules to apply to private lenders. Daniel Fireside is the Dollars & Sense book editor.